Years ago I took a bacteriology course in college. The lab for one particular day was to look at spirochetes (T. pallidum aka syphilis) using a darkfield microscope. Our professor described the hanging drop technique as did the lab assistants later on. None of these educators demonstrated the technique. After trying unsuccessfully for several hours to get a drop to hang over the middle of the depression of the slide I decided to take the easier route of supporting a cover slip on two hairs from my head over a standard slide and filling the space with sample. It worked beautifully well and for many years I used this same technique for impromptu cells whenever needed. They do not last long, evaporation at the edges of the coverslip being the main problem. They are certainly superior to that goofey hanging drop method which unfortunately is described in several microscopy books (1,2). Cells made with vaseline are functional, quickly made but not permanent and very messy. Since I tend to be somewhat klutzy esp when in a hurry I won’t allow vaseline in the same room as my microscopes. Cleaning it from lenses or other parts of the microscope is not much fun. If one consults one of the older microscopy texts such as Hogg (3) a variety of cells are shown including fancy compressing devices. Many of these devices are rather complex in design and require special glassworking and/or machining skills to implement. They also seem rather old fashioned and cumbersome. 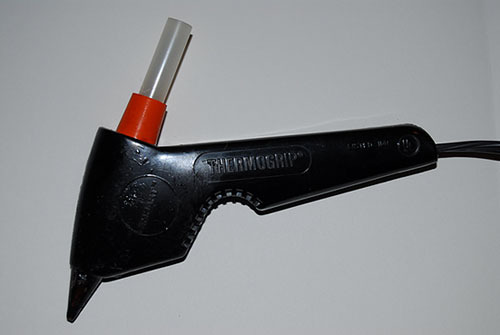 One Christmas my young son gave me a hot glue gun. It wasn’t long before I applied this device (fig. 1) to microscopy. Initially I used it for mounting fibers to a slide. It soon became apparent that it had many other uses as well. With just a slide and coverslip one can rapidly make a durable watertight cell (fig. 2) for containing pondwater or small crystal growing experiments. I published my method in 1992 (4,5) and have used it for many years for viewing pondwater over time. The cells are disposable and readily replaced with minimal expense and time. The glue is a polymer blend that is insoluble in water and non-toxic to small organisms. Fig. 1 A bare bones hot glue gun. Fig. 2 Two newly minted cells. Fig. 3 Component stack prior to gluing. 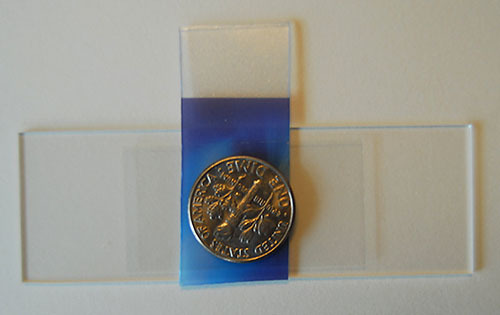 To make a cell I make a stack of a microscope slide, a spacer, a coverslip, and a small coin (fig. 3). The function of the coin is to prevent a fingerprint from marring the coverslip. I hold the stack with my thumb on the bottom of the slide and my index finger on the coin while running a bead of glue at the ends of the cover slip. It is then allowed to cool (about 60 seconds) and then the spacer and coin are removed and the remaining two sides of the cell are completed. A tissue moistened with glass cleaner makes short work of the thumbprint on the slide. When applying the hot glue a much neater seam is produced by pushing the glue gun rather than by pulling it. I hold the glue gun at about a 45 degree angle when applying glue. Spacers can be any flat sheet material cut somewhat narrower than the coverslip is long. The approximate thickness of several common materials is shown in Table 1. When selecting spacers I prefer the thicker credit card. I have a turret of long working distance objectives which allow me to look through the thicker cell at higher magnification (to 700X) without running out of working distance. The completed cell is filled with a plastic dropper or a Pasteur pipette. I usually leave an airspace and seal the cell with the hot glue gun to prevent evaporation. The oxygen requirement of small organisms is not great and they will live for a considerable time (days to weeks) in such an environment. A few words about glue: There are numerous brands on the market and some of these stick better to glass than others. I purchased a very satisfactory glue at a local fabric store. Unfortunately it was sold from bulk and had no brand name. It appears different from hardware store brands by its translucency; one can almost read through it. The hardware store brands were much more opaque and somewhat stiffer. 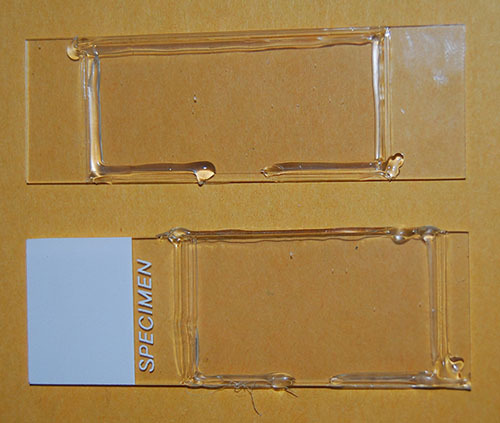 I suggest trying a few adhesion experiments prior to making experimental cells from unfamiliar gluesticks. Originally I had merely wanted a cell that would contain water samples with minimal evaporation and good optical qualities. I used my first cells open to the atmosphere and discarded them at the end of the day. One weekend I left one on my microscope and went away for several days. When I returned I found it and turned on the light for a look. I was startled to observe several large paramecia resting motionless on the bottom of the cell. They remained that way for almost a half hour and I was able to observe them better than ever before. Finally I thumped the microscope stage with my finger tip and the paramecia immediately sprang into action and remained active the rest of the evening. I have since been able to duplicate this behavior using deeper cells made with a 0.6 mm spacer. This sure is an improvement over methocel. Unfortunately I can’t turn it on and off at will! Any questions or comments can be directed to the author Dan McNeil. Published in the May 2007 edition of Micscape Magazine.